When black people cheered after O.J. Simpson’s acquittal, they were not celebrating his release, but defense lawyer Johnnie’s Cochran’s victory over a racist system of justice. On Oct. 3, 1995, I was one of an army of journalists from all over the world covering the verdict of the so-called “trial of the century,” the infamous case of California v. Orenthal James Simpson. After eight months, a jury of 10 women and two men — nine blacks, two whites and 0ne Hispanic — took just three hours to find Simpson not guilty of stabbing to death his ex-wife Nicole Brown Simpson and Ronald Goldman. In the courtroom, Simpson sighed in relief, his star attorney Cochran clenched his fist and slapped his client on the back, as the rest of the so-called “dream team” of defense lawyers — including Robert Shapiro, Robert Kardashian, F. Lee Bailey and Barry Scheck — huddled in victory. O.J. 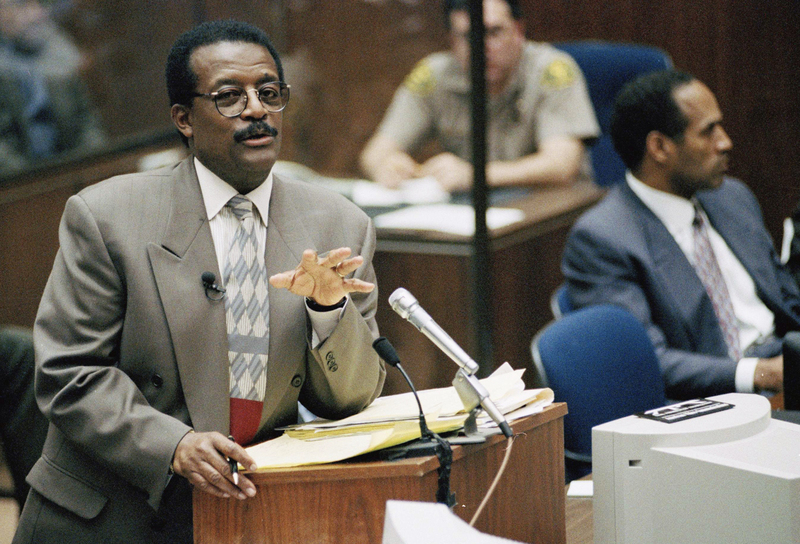 Simpson defense attorney Johnnie Cochran speaks to defense witness Rosa Lopez during redirect, March 3, 1995, at the Criminal Courts Building in Los Angeles. At a news conference, Cochran thanked God, and members of Simpson’s family shared their elation with the decision and their unwavering belief in Simpson’s innocence. “We knew O.J. was innocent, and we had all the confidence in the world in the team that was put together … I just feel like standing on top of this table and dancing a jig,” said Simpson’s sister, Shirley Baker. On the street outside the Los Angeles County Courthouse and in offices and homes across the country and beyond, reactions mirrored those in the courtroom. Shock and disbelief gripped many — mostly white — who believed that Simpson had gotten away with murder, while jubilation burst out among blacks, including many who joyfully danced the jig that Baker said she had wanted to. The night of the verdict, I appeared as a guest on the ABC News show Nightline and tried to explain what black people were expressing after the verdict. The next day I received telephone death threats at my office. What Sharpton and the throngs of black people who rejoiced in Simpson’s not-guilty verdict were saying was that the “trial of the century” was as much an indictment of the criminal justice system in L.A. and the rest of the nation as it was a murder case. And Cochran had won it not just for Simpson, but for all African-Americans. Black people were not rejoicing in the unresolved loss of two lives and the pain of the Brown and Goldman families. They were celebrating how a highly skilled black attorney had used race — so often used against black people — to convict a legal system that historically discriminated against black defendants on an international stage. Some dismissed the verdict as “jury nullification” by a predominantly black and female jury that had simply ignored the evidence and refused to convict a rich and famous black celebrity. For her, and so many other African-Americans of her generation — especially women — Simpson was a symbol of the many nameless, faceless black criminal defendants who suffered, even perished at the hands of a racist criminal justice system because they could not afford a dream team of high-priced legal counsel. When Cochran, who’d built a successful career defending black people long before he joined Simpson’s team, told the court and the world that the Simpson case was as much about race and injustice as it was about murder, my mother and millions of other black women heard him loud and clear. 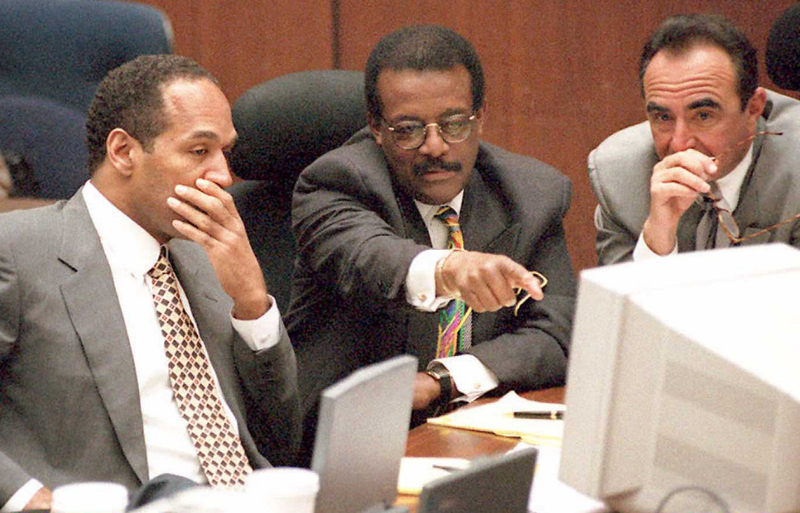 Defense attorney Johnnie Cochran Jr. (C) points to a screen showing evidence collected at the crime scene as O.J. Simpson (L) and attorney Robert Shapiro (R) look on 11 April during the O.J. Simpson murder trial. Los Angeles police detective Dennis Fung is testifying during the morning session. “Race plays a part of everything in America,” Cochran had said when asked about playing the “race card” in the trial. “In this case, it was introduced by witness Mark Fuhrman,” he said, referring to the avowed racist Los Angeles police officer who’d testified against Simpson and whom many believed had been part of a Los Angeles Police Department conspiracy to frame Simpson. As my mother, who grew up in the segregated Jim Crow South as a daughter of dirt-poor Mississippi delta sharecroppers, saw it, the only reason that Simpson’s trial received so much attention was not just because of his wealth and fame, but because he was a black man who had been accused of murdering white people, one of them a white woman. “If O.J. had killed Marguerite [his first wife, an African-American], it would hardly have been the ‘trial of the century,’ ” she said. Race is always a factor in how and why the media play one case bigger than another, Cochran had said, skillfully pricking the open sore of racial prejudice in America and painting his client as one more victim of an institutionally racist criminal justice system. “Maybe you are the right people at the right time in the right place to say: ‘No more,’ ” he told the jury in his closing argument. Shapiro, Simpson’s lead attorney, would later condemn Cochran’s defense summation comparing the prosecution’s case to Hitler’s campaign against the Jews, for “not only playing the race card, but playing it from the bottom of the deck.” The split even among Simpson’s lawyers underscored the role of race in the case and may help to explain how white Americans and black Americans listening to the same facts could interpret the verdict in such radically different ways. As a journalist, I have never publicly expressed my view of Simpson’s guilt or innocence. Based on the facts as they were presented at the trial, I believe the verdict was the correct one. But as long as there are white people who do not believe there is still racism in America and black people who do not believe, as Los Angeles county prosecutor Christopher Darden told the jury, that Simpson could be “a great football player” and “a murderer,” they will never be able to understand and appreciate the pain or elation over a verdict like that in the Simpson trial or the Rodney King trial or the Trayvon Martin trial or the Michael Brown trial or the as-yet-unnamed trials that are sure to follow. Sylvester Monroe is an Assistant Foreign Editor at the Washington Post. He was a correspondent in the Los Angeles bureau of Time Magazine during the trials of four white L.A. police officers accused of beating black motorist Rodney King and the O.J. Simpson trials.